Springer Publishing is an American publishing company of academic journals and books, focusing on the fields of nursing, gerontology, psychology, social work, counseling, public health, and rehabilitation. 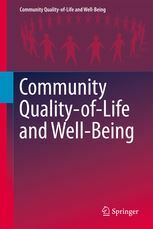 The Community Quality of Life and Well-being book series is a collection of volumes related to community level research, providing community planners and quality of life researchers involved in community and regional well-being innovative research and application. Formerly entitled, Community Quality of Life Indicators: Best Practices, the series reflects a broad scope of well-being. Next to best practices of community quality-of-life indicators projects the series welcomes a variety of research and practice topics as related to overall community well-being and quality of life dimensions, whether relating to policy, application, research, and/or practice. Research on issues such as societal happiness, quality of life domains in the policy construct, measuring and gauging progress, dimensions of planning and community development, and related topics are anticipated. This series is published by Springer in partnership with the International Society for Quality-of-Life Studies, a global society with the purpose of promoting and encouraging research and collaboration in quality of life and well-being theory and applications.